Cut a piece of soft rope 9 feet long for the "sideline." Tie a non-slip knot to form a loop (like a honda) that you can double the loose end of the rope through. 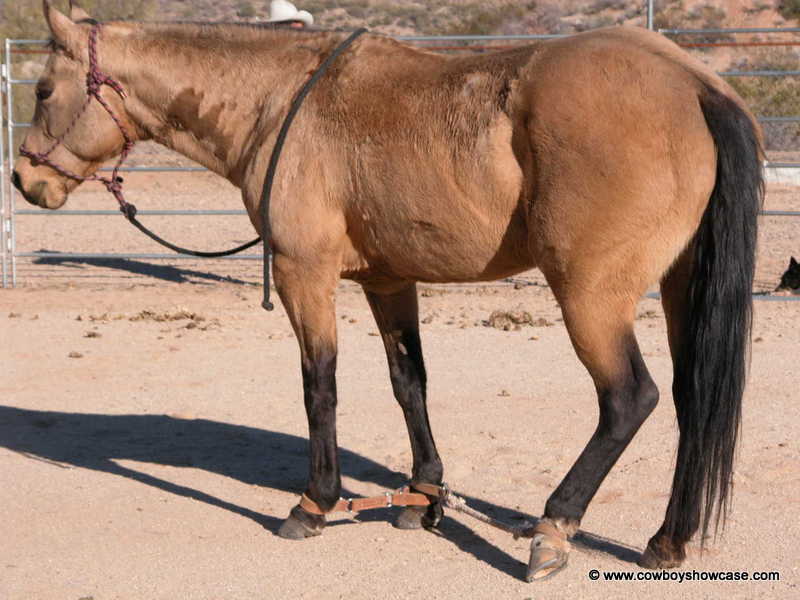 Attach the rope around a back foot pastern, just above the hoof, by drawing the loose end of the rope through the honda loop and pulling up the slack. Draw the back foot forward and up with the sideline rope. 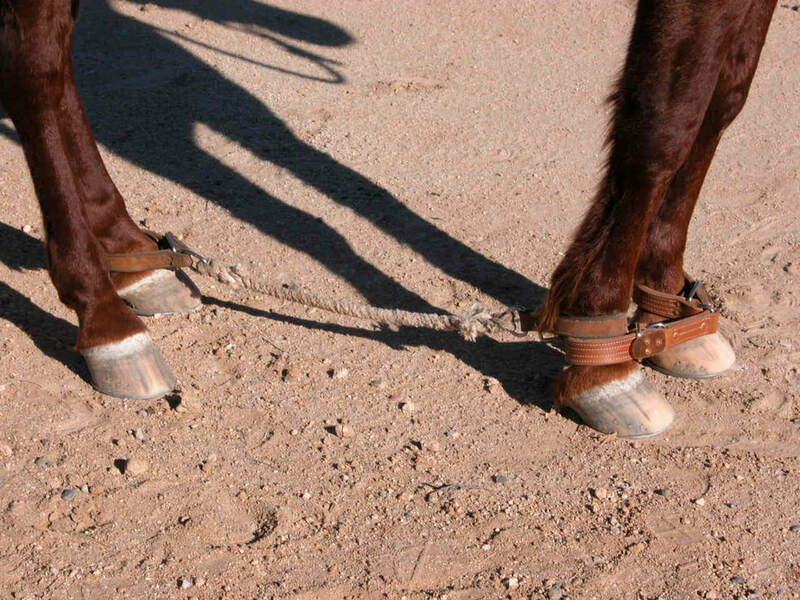 Attach the front loose end of your sideline rope to the hobbled front foot on the opposite side of the horse. Your horse is now safely restrained from hopping off wearing the front foot hobbles. Caution: a horse should be hobble trained before you attempt this. In order to keep the sideline rope handy, I attach it behind the cantle of my saddle. 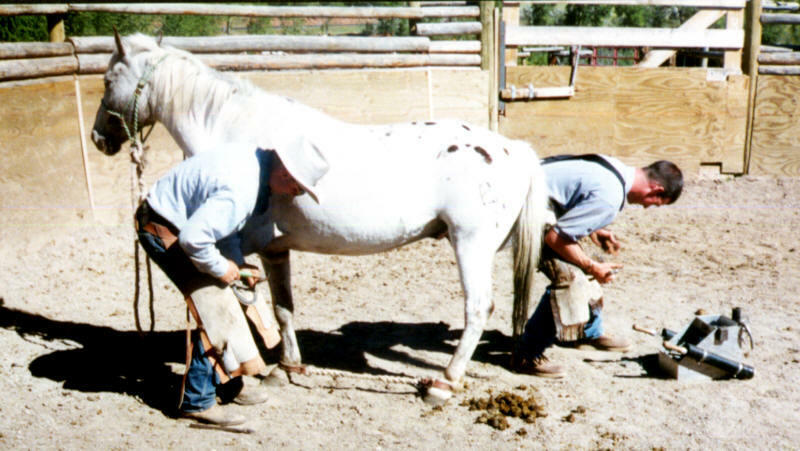 Two rings have been attached on either side of the cantle, under the rear saddle string conchos, to secure the sideline rope and a piggin' string. A snap is also attached here below the ring where a quirt may be attached. Long saddle strings can also be placed through these rings to keep them out of the way when the strings are not in use. Caution: Be sure to untie your sideline rope knots before attaching the rope through the saddle rings so that you only have loose ends hanging off your saddle. That will keep you from hanging up a spur or foot when mounting or dismounting. Hard-to-shoe horse sidelined for the shoers.